NEW ORLEANS The Coast Guard was searching Friday for two workers missing after a fire erupted on an oil platform in the Gulf of Mexico, sending an ominous black plume of smoke into the air reminiscent of the 2010 Deepwater Horizon explosion that transformed the oil industry and life along the coast. The fire, begun while workers were using a torch to cut an oil line, critically injured at least four workers who had burns over much of their bodies. An official from Black Elk Energy retracted previous comments made by its CEO that two of the workers died, CBS affiliate KHOU Houston reported. Black Elk is an independent oil and gas company headquartered in Houston. The images were eerily similar to the massive oil spill that killed 11 workers and took months to bring under control. It came a day after BP agreed to plead guilty to a raft of charges in the 2010 spill and pay a record $4.5 billion in penalties. There were a few important differences with the Deepwater Horizon explosion that killed 11 workers and began one of the nation's biggest environmental disasters: Friday's fire was put out within hours, rather than burning for more than a day and causing the rig to collapse and sink. It's a production platform in shallow water, rather than an exploratory drilling rig looking for new oil on the seafloor almost a mile deep. A sheen of oil about a half-mile long and 200 yards wide was reported on the Gulf surface, but officials believe it came from residual oil on the platform. "It's not going to be an uncontrolled discharge from everything we're getting right now," Coast Guard Capt. Ed Cubanski said. Coast Guard Chief Petty Officer Bobby Nash said late Friday that monitoring continues to show no oil is coming from the well. The fire had since been extinguished, said Coast Guard spokesman Drake Fore. He said Coast Guard aircraft and boats were searching for two missing people. Eleven people were taken by helicopter to area hospitals or for treatment on shore by emergency medical workers. Taslin Alfonzo, spokeswoman for West Jefferson Medical Center in suburban New Orleans, said four injured workers arrived in critical condition with second- and third-degree burns over much of their bodies. Two were sent by ambulance to the burn center at Baton Rouge General Medical Center. Two others were to be sent later. A spokeswoman for Terrebonne General Medical Center in Houma said the hospital was treating two workers who were in good condition. Several other workers were taken to Lady of the Sea General Hospital in Cut Off. None was listed in critical condition, according to a spokeswoman, who wouldn't specify how many patients the hospital was treating. The production platform owned by Black Elk Energy is about 25 miles southeast of Grand Isle. The Coast Guard said 24 people were aboard the platform at the time. Cubanski said the platform appeared to be structurally sound. After the April 2010 explosion on the Deepwater Horizon, that rig burned for about 36 hours before collapsing and sinking to the Gulf floor. The Black Elk platform is in 56 feet of water. Cubanski said 28 gallons of oil were in the broken line. A federal official in Washington said a team of environmental enforcement inspectors was flying to the scene. David Smith, a spokesman for the Interior Department's Bureau of Safety and Environmental Enforcement, said the team was dispatched from a Gulf Coast base by helicopter soon after the Coast Guard was notified of the emergency. Smith said the team would scan for any evidence of oil spilling and investigate the cause of the explosion. "This is yet another reminder that our work on oil drilling safety is not complete," said U.S. Rep. Ed Markey, the top Democrat on the House Natural Resources Committee. Black Elk is an independent oil and gas company headquartered in Houston, Texas. The company's website says it holds interests in properties in Texas and Louisiana waters, including 854 wells on 155 platforms. The company said on its website that "our thoughts and prayers are with those who are impacted." The company said it was still collecting information and would issue a statement later. The CBS News Investigative Team reports that Friday's explosion is the fourth incident associated with Black Elk in nearly two years. Last September, the company paid a fine of $307,500 after the federal Bureau of Ocean Energy Management found that Black Elk let a well part go longer than the required six months without being tested for leakage. In March, an injured rig worker filed a lawsuit against the company, accusing Black Elk of "creating unreasonably dangerous conditions on the platform" and a "failure to provide a safe place to work." Black Elk denied the allegations. 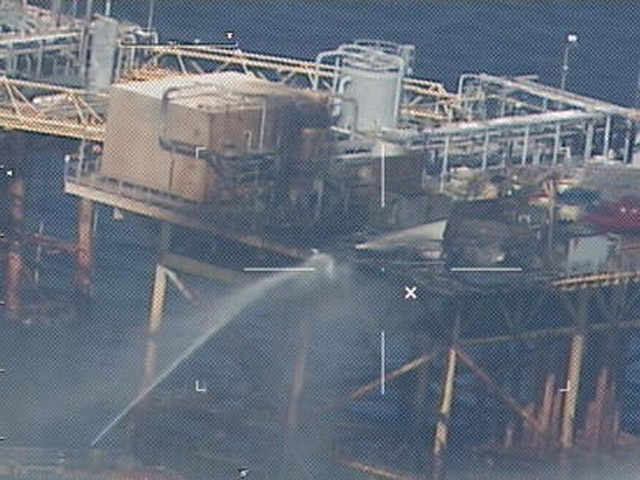 In February 2011, a battery charger caused a fire on a Black Elk rig in the Gulf of Mexico, according to an accident report from the Department of the Interior. Findings from an investigation suggested that the fire was caused by a battery that had shorted.